Be the first to share your favorite memory, photo or story of Karyl. This memorial page is dedicated for family, friends and future generations to celebrate the life of their loved one. K. Jeanne Heblinger, of Cedarburg, formerly of Elgin, IL, passed to Eternal Life in the evening hours of Friday, February 1, 2019 at her residence. She was 85 years old. 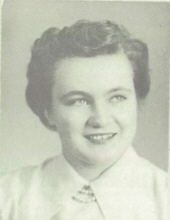 Jeanne was born in Lannon, WI on February 23, 1933, daughter of Alfred Joecks and Elizabeth Bleck Joecks. She grew up in Lannon and graduated from Menomonee Falls High School with the class of 1951. On September 25, 1954, she married George Heblinger at St. John’s Lutheran Church in Lannon. Jeanne worked as a secretary for many Elgin area businesses, including Easter Seals, St. Joseph Hospital and the Mental Health Clinic of Elgin. After retirement, the couple moved back to Wisconsin, settling in Cedarburg. Jeanne was a very active member of First Immanuel Lutheran Church, and the “Fabulous Reds” of the Red Hat Society. She was an avid Green Bay Packers fan and enjoyed entertaining her friends and family. Jeanne is survived by her husband George of Cedarburg and her daughter Mary (Dennis) Namovice of Gold Canyon, AZ. She is further survived by her grandchildren Bethany (Keith) Trybus of Surprise, AZ and Ryan (Janie) Anderson of Mesa, AZ, five great-grandchildren: Connor, Lily, Emma, Mason and Coraline, siblings James (Rose Mary) Joecks of Hubertus, Mary “Mutz” (the late James) DeQuardo of West Bend, Nancy Best of Hartford, nieces, nephews, other relatives and many friends. Funeral services will be held on Thursday, February 7th at 6 PM at the Eernisse Funeral Home, 1167 Washington Ave., Cedarburg. Pastor Randy Rausch will preside over the service. She will be laid to rest at Sunnyside Cemetery in Lannon. Visitation will take place on Thursday, February 7th at the Funeral Home from 4-6 PM. Memorials suggested to First Immanuel Lutheran Angel Fund or Living Word High School. To send flowers or a remembrance gift to the family of Karyl Jeanne Heblinger, please visit our Tribute Store. "Email Address" would like to share the life celebration of Karyl Jeanne Heblinger. Click on the "link" to go to share a favorite memory or leave a condolence message for the family.